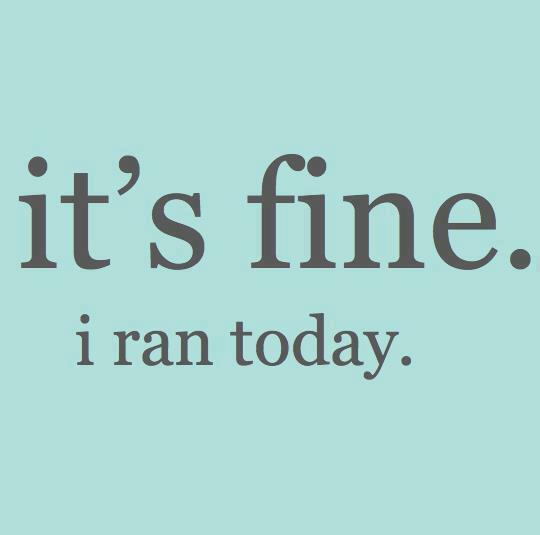 This is how I often feel after running……..like it doesn’t matter what they world throws at me after I’ve put in a few miles. Everything is slightly better, if not much better, after I’ve finished a workout. But here’s the thing-I only feel this way when I run first thing. Like step out of bed, into running shorts and top, tie shoes, turn on Ipod and get out the door. The longer I delay my run, the less likely I am to feel like everything is great. If I go to work, come home, cook dinner, get kiddos to where they need to be and THEN try to run, forget about it. I spend the day worrying that I won’t be able to get my work out in, that it will rain, that there will be some freak hail storm that will keep me inside. Then if the proverbial stars align and I do get to run I spend my workout ruminating over the events of the day, not focusing on what I’m doing. The best running work I do happens when I think very little, when I shut down my over-analytical brain, listen to my music, my breathing and my footfalls. I’ll return to work next week and running early will become critical to my training plan. “Sleeping in” till 7am will soon give way to 4:30am alarm clocks and running in neon colors to alert drivers to my presence on the roads. But I’ll be fine, as long as I’m still running. What about you? Do your workout plans change when kids return to school? Do you have a time of day that you prefer to work out?